Capturing the exuberance of Mykonos, the Panoramic Room is designed for sociable holidaymakers who like to preside over a crowd. Marble, plaster and wood abound, allowing the premium quality of the raw material to speak for itself. The hand-sculpted wood simulates the surface of the sea, mixing island chic with cosmopolitan mystique. 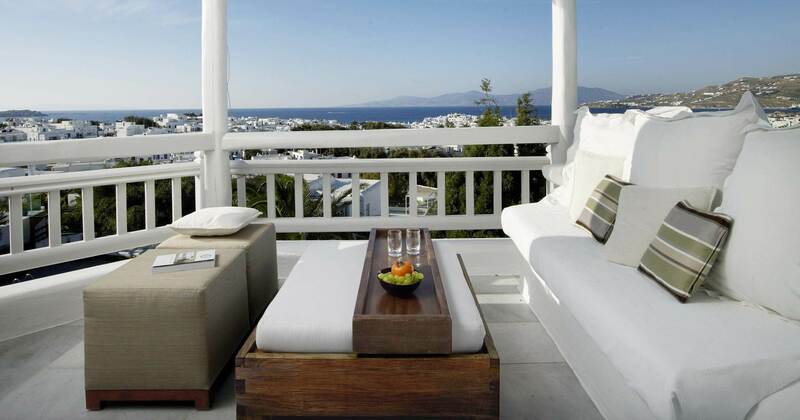 Located on the first floor, the Panoramic Room practically floats over the pool, featuring a private terrace with sweeping views of Mykonos Town, the Aegean Sea and the entire Belvedere Hotel. A cut above the rest, this is an accommodation option you’ll want to share with your friends, if only for an aperitif as the sun goes down. Crisp linens and billowing white curtains add to the floating effect that’s sure to hold you in thrall for the entire duration of your stay. Designed for unapologetic extroverts with endless cocktail parties in mind.